“Bright” is a film that is built on a wonderful idea. Take Tolkien fantasy and make it the modern day world…from here the story tells itself and it is that core idea that keeps the film from ever being bad, even though some of the writing doesn’t work at all. David Ayer also worked on “Suicide Squad,” and I honestly enjoyed this film more as the action and editing are much more solidly done and even though there are many holes in the universe in regards to magic and lore…it never stops being fun or forget what drives the core characters. This is a film that has been panned by critics and honestly doesn’t deserve the hate. I’ll explain more on why, deeper into the review. “Bright” was directed by David Ayer (who was also one of the producers), written by Max Landis and produced by Eric Newman and Bryan Unkeless. The story takes place in a world where an ancient Dark Lord was defeated and 2000 years later on modern day Earth, humans, orcs, elves and the other 9 races live together in a separate class structure, with the Elves as upper class, humans in the middle and Orcs as the disenfranchised outsiders. The story follows human LAPD cop Daryl Ward and the first orc cop Nick Jakboy as they investigate a mysterious cult tied to the ancient Dark Lord defeated long ago. The Pros: The World – The world is amazing, take a Tolkien level backstory with the whole 9 races and the defeat of a Dark Lord (who it implies as an elf) and now it is modern day and how the war went defined the class structure of the realm with orcs being lower class for having served the Dark Lord years ago. There cultures are really unique too, humanity is basically us but the orcs have blood honor and getting blooded as earning respect, elves are tied to magic and own the government but also have a cult tied to the Dark Lord…and there are 6 other races we learn nothing about. Fantasy Races as an Analogy for Race and Class – Orcs live in the poor areas and the only rich orcs we see tend to be gangsters, humans walk between the different areas and there are elf only areas of town. The analogy for racism is obvious and it works, from “Orc Lives Matter,” and the graffiti in the opening…this is a movie that has a deep under current that it doesn’t need to do much to explore as the story tells itself in regards to the clash between orcs, humans and elves. The Main Three Characters – The main reason this film isn’t awful are the three main characters have arcs that work. Each of them has changed by the end of the story and that is what I’ll go into in their individual character profiles. Daryl Ward – Daryl is played by Will Smith and is a family man who was once admired by the LAPD but messed up later on, which is why the force put him with the first orc police officer. His arc is overcoming his prejudice and by the end he discovers he is a Bright (someone who can wield magic wands and magic) and considers Nick his partner as he discovers just how bad orcs have it and grows as a cop and person. Nick Jakoby – Nick’s arc is embracing his role as a cop and finding a wider role in his people as when Tikka (the elf who escaped the Dark Lord cult with a wand) resurrects him after a orc gang leader kills him he is seen as their savior. His arc is learning to trust Daryl and finding his place in the force and his partner. It is really well done and I loved how earnest his character is. Edgerton did a good job in the role. Tikka – Tikka is the Bright elf who escapes the cult she is a part of and steals the cult leader (Leilah’s) wand in the process. She is a damsel through a lot of it, which I hated, but once it is revealed to have been a ruse it is fantastic as she both resurrects Nick and saves Daryl quite a few times. She is presumed did until Daryl spots her at the end, though whether this is her or the return of the Dark Lord or something else, is left up to the sequel. Okay: Leilah and her Cult – The cult is threatening and it is cool seeing elves fight with magic and daggers and Noomi Rapace is fun as Leilah, but her and the cult get almost no exploration. This was a shame as she and the other actors are in it are talented people…but we never got their motivation or learned anything new about the Dark Lord. Magic Task Force – This is the FBI who arrive at the very end and cover up the events with the cult. They are lead by an elf who has a huge issue with the cultists and sees them as embarrassing to elves. He is compelling but we never get his motivation either, and the Magic Task Force is mostly useless though they work as a plot device. The Writing – There are gaping holes in the lore and some of the dialogue is cringe-worthy. I’m not putting this as a con because sometimes it works and the world does feel lived in. But it isn’t a pro and does bring down the overall quality of the film. The Cons: Predictability – The biggest con is predictability, I knew Nick would be brought back to life, I knew that Daryl would end up being a bright and I knew they’d have to learn to work together. I could have used a lot more twists than just corrupt cops and Tikka just pretending to need to be rescued. Holes in the World – Who are the 9 races? We see some random ones but know nothing about them and their roles, how does magic work? Who created the wands? How did this world become as it was in the present? These are just some of the questions that keep the film from being great as the fact it isn’t fully fleshed out is the biggest detriment to the story. This is a movie that aspired for greatness and because it did, managed to be overall enjoyable, even with the flaws. “Bright 2” has already been slated and I can’t wait to see what they do with this universe as we know nothing about the other 6 races, nothing about the Dark Lord and even how magic works. If these questions had been answered than this would have been a really good film. I still recommend this one though, it isn’t perfect, but it is a lot of fun and it is a universe I can’t wait to return back to. This is a total B movie, largely because of some of the hokey dialogue and the plot holes but it is worth seeing once. In regards to how I review this first game of 2 (I plan to review “The Frozen Throne” after I beat it again), it holds up and I’ll give a brief analysis on gameplay (pros and cons) and how the story was. The story in the end will be my overall judge for any game where the gameplay is at least enjoyable. Like my films I enjoy my games being compelling and having a narrative that pulls me in. For giving recognition where it is due, Chris Metzen wrote the story (which explains why he is the head of storytelling on WOW for best and for worse) directed by Frank Fierce jr. and produced by Chris Sigaty. The story picks up after Warcraft 2 (all the games so Draenor is destroyed and the Horde Orcs are defeated and in internment camps) and begins with Thrall freeing the rest of his people Lordaeron on promptings from a mysterious prophet. From here we trace the rise of the Scourge, the return of the demons of the Burning Legions and the introduction of the Night Elves. SPOILERS ahead (old game so may not mean as much). The Pros: The Gameplay – As stated above, the gameplay is too rushish in multiplayer but the Hero concept payed off. I wouldn’t being loving “Heroes of the Storm” if not for this game. So I take the pros over the cons and in the end it is pro. Each hero has unique ability, and depending on your playstyle (I tend to go for auras over abilities) helps in the campaign, custom and multiplayer games. In the end the campaign was fun, which is a win for me. I enjoyed playing this game again after not playing it since High School, and can’t wait to replay the expansion. The Alliance – We only really get to see the Fall of Lordaeron in this and the rest of the Alliance is purposely left out. I get this as in if the game fails, we get the fall of the Alliance from past “Warcraft” games, but if it succeeds….we get “World of Warcraft” which is still going with the most recent game being “Legion.” The fall is told really well, with Arthas killing people in “The Purge of Stratholme” to save them from being enslaved, and going mad after. It is compelling and in the end the Scourge wins ending with Arthas turning on his troops, sacraficing his friend Magni and killing his father the King, leading into the next campaign. Arthas is the drive and seeing his fall is how Anakin in in the Star Wars Prequels should have been done. 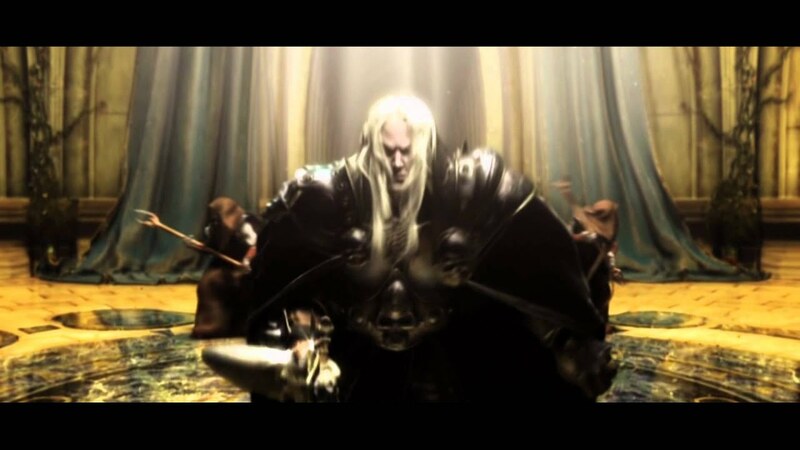 The Scourge – The Scourge Campaign involves Arthas destroying his own nation after the killing of his father after the end of the Human Campaign. It is really good. You start out weak, resurrecting the Necromancer Kel’Thuzad who you killed during Arthas’s fall to empower the Scourge and bring in the Burning Legion who are behind it all and the big threat from all past Warcraft games. It is really good and you get to see how Arthas without a soul is like. He is funny and also evil as hell. He kills his mentor Uther, destroys the Kirin Tor (who is the faction of his complicated relationship – Jana) and in the end feels powerless until he returns later in the last campaign. He feels like a pawn but empowered in his malice and it is Kel’Thuzad who hits at the plans to come as Ner’zhul predicted the fall and conquest and his freedom and Scourge sovereignty out of it. The Horde – The Horde is complicated, back in Middle School they were my favorite faction, and I still love playing compicated orcs, nowadays though. Grom, who “redeems” the orcs only fights. Thrall who is the Warchief is constantly keeping him in check and even though Grom kills the big bad (after he kills a good demigod) doesn’t redeem him in my eyes. This campaign was fun, but Grom pissed me off. Thrall was good but he never apologizes to Jana (who is Arthas’s complicated and brings the survivors of Lordaeron to Kalimdor) and only sees Grom as hero. Th orcs deserved better and World of Warcraft really hasn’t redeemed them yet. They are still conquerors and not fully refugees and that is a toxic narrative. I’m a fan of the orcs and this time around could not embrace them. They don’t see what they do as wrong and only live to fight, which even if they aren’t the evil of Tolkien orcs doesn’t put them on par with the Night Elves and Humans. They deserved better in this game, though still putting as a pro. This was the only time I’ve played orcs in a somewhat redeeming light and I want more of that. They are a compelling species and I love their aesthetic. The Night Elves – The Night Elves story is short but awesome. You have the warrior women who protect the forests and bring in the Druids when things to get apocalyptic. Tyrande, the Priestess of the Moon is a fanatic but you get her perspective given she hasn’t had Outsiders in 10,000 years and in the end she appreciates the orcs and humans who defend Mount Hyjal and the World Tree from the big bad Archimonde who wants to consume Azeroth. Furion is standard wise old guy but fighting with the Druids of the Claw was fun, Illidan is the Boba Fett in this game where he was trapped and fights for himself because all have wronged him and stars in 1 mission (but has an awesome aesthetic). I enjoyed this campaign and wanted at least 1 more with Illidan to develop him further, though I know the expansion to this game does that really well. This is where the complicated characters are. Jana is savior and love interest and doesn’t get beyond that and the Kirin Tor and King are (you know us from Warcraft II lore if you read the books) which coming back to the game wasn’t enough. The Night Elves campaign is short but it is a rich campaign. The Fall of Arthas – The most compelling story in this game is that of Arthas. He turns on the past allies of the High Elves and kills their general Sylvanas (who I want to say now is amazing come “The Frozen Throne” given what goes down this game). He kills his further, turns on his allies. Consumed by revenge he forsakes everything for the power to achieve his revenge. He is the perfect Anakin and I get why “Wrath of the Lich King” is so memorable even though I haven’t played and avoid MMORPGS. Defeating the Burning Legion – This is a win that pays off. We see them come during the Scourge Campaign and even though Thrall and Grom defeat the general Mannaroth, we saw Archimonde decimate a kingdom in the Scourge cinematic. The threat is always real, especially with most Night Elf missions being a race against time, and this is them with allies and them having defeated the Burning Legion in the past. The payoff is amazing and holding Archimonde back to the second with Tyrande and Furion to the second was such a rewarding playthrough. For me every Night Elf mission mattered, both from challenge and investment in the characters. Okay: More Exploration / Missions Could Have Made Perfect – Grom should have been shown being noble and not just a blood lust fighter to make his redemption mean something and not just him escaping his addiction to battle, Jaina deserved a mission escaping from the Scourge and her former lover Arthas and to give her more agency and the Night Elves needed a mission to work with the Alliance and Horde…a custscene wasn’t enough given Grom killed one of their Gods. This took away from making the game perfect. Grom’s “Redemption” -This guy only lives for fighting. He has a great look, but he needed more. We never saw him as loving any more than war, he cared about Thrall and felt bad but each time that mattered he went back to fighting. There is no reason for Thrall to trust him or for the Horde to be forgiven beyond “The End of the World” in the Night Elf campaign. He deserved better given that the character came back in “Warlords of Draenor” and his son was Warchief of the Horde…and like his dad ruined it. I am a fan of the Horde, I like orcs as not simply bad guys…but Warcraft’s redemption doesn’t fully work. Chris Metzen was the writer and the Horde deserved better if they were going to be redeemed. I want good orcs, but you won’t get them from Grom killing Mannaroth. The flaws run to deep if Grom wants to fight every mission, him killing his species enslaver (Mannaroth), doesn’t justify him willing to kill anyone for not being an orc through the campaign. Looks cool, but the guy is deplorable. “Reign fo Chaos” is a flawed and amazing game that is well worth your time if you enjoy RTS games. I can’t wait to replay “The Frozen Throne” given how fun Arthas and Illidan are to play as heroes and I love the “Forsaken” campaign, which was actually a great set-up for the Forsaken joining the Horde in WoW and further Sylvanas development. This game is self contained, it is set-up to be self contained if it fails given the big bads are beaten and we have a world that no longer needs “Guardians.” For this reason I rate the game highly. There is some great character development, even if I wanted more for the orcs and night elves. If you like fantasy games or rts’s check this game out. It has been out for years, but is well worth your time. Final Score: 9.3 / 10. A solidly great fantasy RTS game. 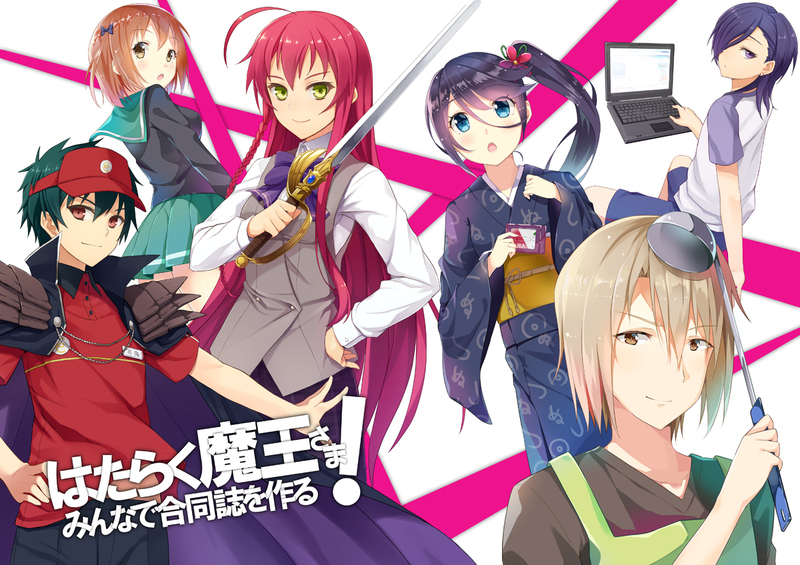 It has been a while since I reviewed an anime, and “The Devil is a Part-Timer!” was one I had already gotten halfway through so I decided it was time to finish it, to see how it held up against the other animes I enjoy. This was a solid anime but has some of the common tropes I found annoying in that the Devil has a harem making it a harem anime (though thankfully he doesn’t hook up with anyone) and there is a contrast between the drama and the comedy that is jarring at times. To the shows credit on both counts it manages to offset some of it, which I’ll get into deeper into the review. The anime was based off a light novel of the same name written by Satoshi Wagahara with the anime being produced by White Fox and directed by Naoto Hosoda. The story involves the Demon Lord Satan and his general Alciel escaping their world of Enta Isla is the war they are losing against the Church, into Tokyo. Here they find themselves powered down leading Satan to take up a job at the local MacRonalds so they can afford to live in this realm. The hero Emilia who is hunting them crosses over too and takes up a job at an office as others from their realm pull them into what they behind as they find themselves changed by our world. The Pros: The Premise – The premise is really cool! A powerful being from a fantasy realm forced to live as human and take a mundane job…there is room for so much drama there that sometimes the show does a good job exploring. The Action – The fight scenes are a lot of fun and pretty epic in their own way as we see powerful angelic and demonic being tear apart the town in their standoffs. The Characters – The characters are the main reason to watch this show, besides the the premise itself being draw enough. They are fascinating and most of them have arcs. Chiho – Chiho is a high school student who has a crush on Satan, even after learning who she is. She is the heart of the anime as it is her appeals to goodness that change some characters back as she sees the most how Satan was not who he was before. Lucifer – Lucifer is the villain in the first part of the anime but ends up being part of the good guys after he is depowered. Though he still manages to cause a lot of trouble when he does a ton of online shopping. His moment of great is when he punches the corrupt Church leader Olba during the final fight and shows that he isn’t about power and likes being human. Suzuno – Suzuno is an inquisitor sent to kill Satan who changes over the course of the anime as she learns how to feel and sees that Satan is good and that she hates the fact that the Church and Archangel are using her and doing the evil they claimed Satan was. She helps Satan in the final fight after trying to kill him and is one of the core group. Ashiya – Ashiya is the comedic relief as he is the domestic at the apartment. He is a good character as we see his devotion is what defines him, though he does long for more just not from Enta Isla. Emilia – Emi is the hero sent back to defeat Satan as Satan’s forced killed her family in Enta Isla. She is obsessed with stopping him until she sees the Church is the one hurting people and forms an alliance with him the process. Their friendship is very combative and reminded me a lot of Ron and Hermione. Sadly she doesn’t get to take part in the final fight though she saves the Demons in the last episode from a scam. I wish they’d done more with her character as she is really cool. Satan – Satan is the King of Demons and is very human after passing over as he is happy with his job at the MacRonalds and just wants to help people and have a life. In this way he doesn’t change at all and we never get how he changed from the Demon Lord of before. He is a great character though who could do with more exploration as his personalities between the two different worlds are very different. Okay: The Comedy – The comedy is all over the place, the MacRondalds stuff tends to be funny since Satan is serious about his job but a lot of the humor tied to the girls who like Satan is really hit and miss. The Ending – Satan stays to be a MacRonalds manager and is friends with the hero and the other friends he made as they stop a con man in town. It feels like a day in the life episode and was a waste as it did nothing to tie to Enta Isla or how they’d all changed. They still felt like the same characters from past changes. The Cons: Tonal Shifts – The show wants to be a comedy and a drama but doesn’t pull it off nearly as well as “Voltron.” This largely due to having comedy in scenes that should be dramatic and vise versa. It is hard to know when to take anything seriously and that took me out of it. It is somewhat consistent in this in that the shift is happening all the time but I hate that in any kind of show. The Villains – The villains are a corrupt Church official, Lucifer at one point who becomes a lazy computer guy and a pervy archangel who is just turned into a pervy human. I was really disappointed in the villains in this show. The Enta Isla Plot – We get really cool glimpses of Enta Isla…from the Inquisition, to Emi’s backstory, etc. But it doesn’t amount to anything. In the end every character who crosses over just becomes part of our world and none of them go back. This was missed opportunity given Enta Isla sounded like a place that needed a lot of help. The premise is really cool but the show really feels unfinished at the end, and some of it’s worst tendencies were on display, such as fanservicing the female characters and having everything be about Satan in regards to saving the day, when Emilia was as much a part of the story on fighting corrupt folks tied to the Church as he was. This isn’t a great anime but if you are looking for a quick escape, the season is only 13 episodes long and the characters are great even if the tone can sometimes be all over the place. The game series “Warcraft” is one I have a history with dating all the way back to Warcraft II and it’s expansions. They were my introductions to this universe even though I think Warcraft III: The Frozen Throne is the best storytelling to come out of the series. At the end of the day, all the Warcraft books I read about the First and Second War didn’t draw me in the way the Scourge, Forsaken, Illdari and Night Elves did in Warcraft III, and World of Warcraft was always something I played more casually the few times I did. What bearing does all this have on the review outside of history? Metzen was starting from one of the more weaker places in the lore (Humans were always the most boring faction) so going in it was starting out weak, I wish we’d gotten “Rise of the Horde” as far stories go, that had drama and Orcs are the strongest part of this film….and there are a lot of human characters, making the film enjoyable but weak. 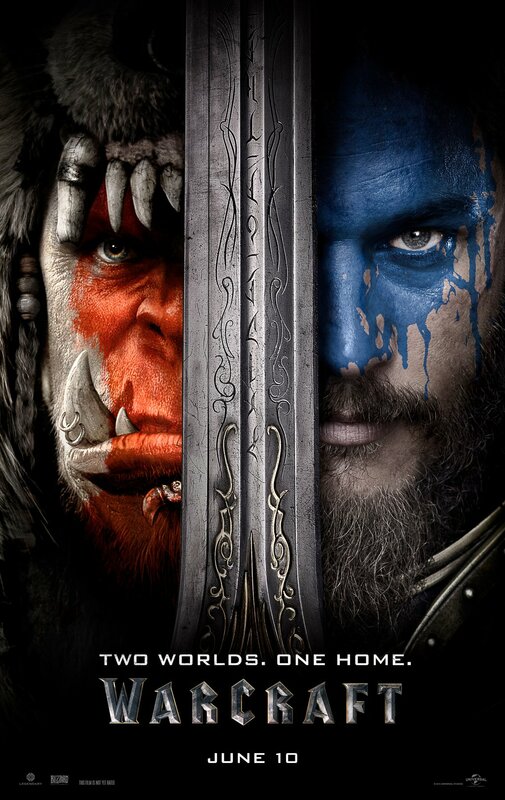 “Warcraft” was directed by Duncan Jones who was a co-writer along with Charles Leavitt with Chris Metzen and produced by Thomas Tull, Jon Jashni, Charles Roven, Alex Gartner and Stuart Fenegan. The story involves the arrival of the Orcs on Azeroth who plan on bringing their forces through the Portal as their world is dying. Lead by the evil Orcish Warlock Gul’dan (Daniel Wu) as Durotan (Toby Kebbell) must work with humanity when he realizes what Gul’dan’s magic did to his world and will do to this one. The Pros: The World – The universe of Warcraft is one that is fascinating…there different planets, different fantasy races and politics between them. Sadly we don’t see much of the politics in this one, but the factions are still present and you feel the size of the world. The Cinematography – The cinematography is just like the Warcraft cinematics. Simon Duggan really did a great job of transferring Blizzard’s style to film. The Soundtrack – The soundtrack also feels like the Warcraft games, which is a plus. The games have always had a beautiful soundtrack that captures the epic fantasy feel of the world. Ramin Djawadi did a fantastic job. The Characters – The characters who work, work really well…those who don’t show the flaws in some of the writing that has come out of the books and games and the universe as a whole. I’ll get into what I mean later. Blackhand – Blackhand is played by Clancy Brown with his usual large and vocal presence. He truly is perfecfr for this role and does a fantastic job as Warchief of the Horde, sadly his role underutilized (just like Ogrim) and he doesn’t survive past this film. Lothar kills him in honorable combat so the orcs let Lothar go free. Poor Felled up Blackhand goes out way too fast. Garona – Garona is a good character and the only female character who actually felt like she had agency beyond telling the guys they are doing a great job. She even got a romance with the hero and got to kill the King and be the double agent among the orcs working for peace between their races. I wish we could have got more of her backstory as we see she’s a slave and half her heritage (Draenie) was used to open the Dark Portal. Hopefully they’ll do more with her next film if they make one, she’s a hell of a lot more interesting than Lothar. Gul’dan – Daniel Wu is awesome! It is wonderful seeing Gul’dan in all his badassery on screen. He is great here and the only competent villain as his people are so afraid of him that they follow him and he wins every fight he gets into. This guy is pumped so full of fel energy that he can take anything. He also is still living at the end (like in the games at this point in the timeline) so curious what they’ll change about him. I really want a “Rise of the Horde” story so we can see Ner’zhul (one of the best orcs and Gul’dan’s mentor). Durotan – Toby Kebbell is the closest thing to an interesting protagonist. In him we see an honorable soldier just trying to look out for his people, and faced wit the fact that his entire race is dying out and all they have is the new world of Azeroth. He dies fighting Gul’dan in a pretty awesome fight. Okay: King Llane – The King is kind of bland but at least he’s given something to do and notices the orcs aren’t all bad given his friendship with Garona. In the games he’s a non-presense too. I really don’t care about Stormwind in the lore and see them as a lore sink (was always a Horde player in WoW). He dies so that Garona can be accepted into the Horde as a hero. Ogrim Doomhammer – Doomhammer is a Frostwolf in this rather than a member of the Blackhand clan. In this he betrays Durotan but leaves the Horde after he sees how the Fel is turning his people into demons and that Gul’dan has no honor. He is the one carrying on the Frostwolf legacy in this after the death of Durotan and Draka. Medivh – Medivh is bland, he is supposed to be crazy but he doesn’t feel there. This character felt invisible and we never get any good interactions with characters except a strange scene with Garona. He dies fighting for Stormwind though after the Demon is beat. The Ending – The orc ending isn’t bad (would have like Blackhand to survive) and I felt Garona becoming the heroic champion was really cool. The human side is just bland though. Maybe this will work as a movie series, but it felt unfinished. The Cons: Lothar – Guy has a son who he has no chemistry with (he doesn’t have chemistry with anyone). He acts a cool and distant and it comes off as forced. He is Action Hero Man*TM and it hurts the story since he’s the main character. Draka – She makes sure Go’el (hate that name, Thrall in the games) is freed on the river and eventually picked up by humans. She exists only as mate and not much else. The games also had this problem too. Draka deserves better. Women as Scenery – Both Draka and the Queen, who besides Garona are the any female characters with any presence feel like non-entities. They exist as plot devices and I wish had been written as actual characters. The Demon/Sargares? -This guy posses Medivh to open the Dark Portal (like in the game), and in this he’s beaten like a little punk. Khadgar drops his own golem on him. At least in the books it was a more epic fight and in WoW he’s an actual raid. This is supposed to be the guy pulling everyone’s strings. Weak villains that aren’t orcs (that Demon who was weak Sargares if it was him) and bland human heroes kept this from being a great B movie. The orcs were awesome as they are in lore and the film really should have been about them. The only things we get that are interesting from the humans are Khagdar as comedic relief and Garona making friends with the humans. Outside of that they are bland and uninteresting. I hope they make more of these films though, there is so much lore in Warcraft and the Rise of Illidan or Fall of Arthas would make an amazing story on the bigscreen and would work within time limit of a film. This film is still okay, but I’d only watch it for the orc scenes.